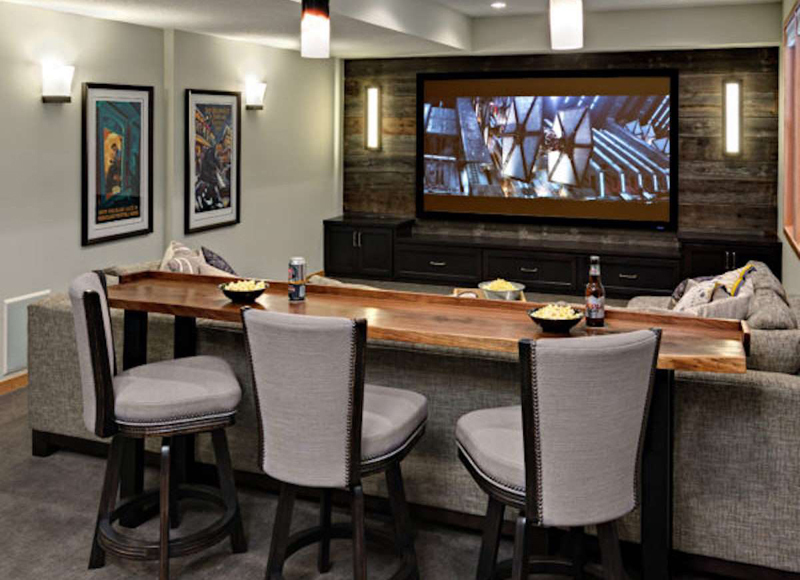 Give your unfinished basement a new lease on life. Liston Design Build added flair to this basement with a warm gray and white palette. 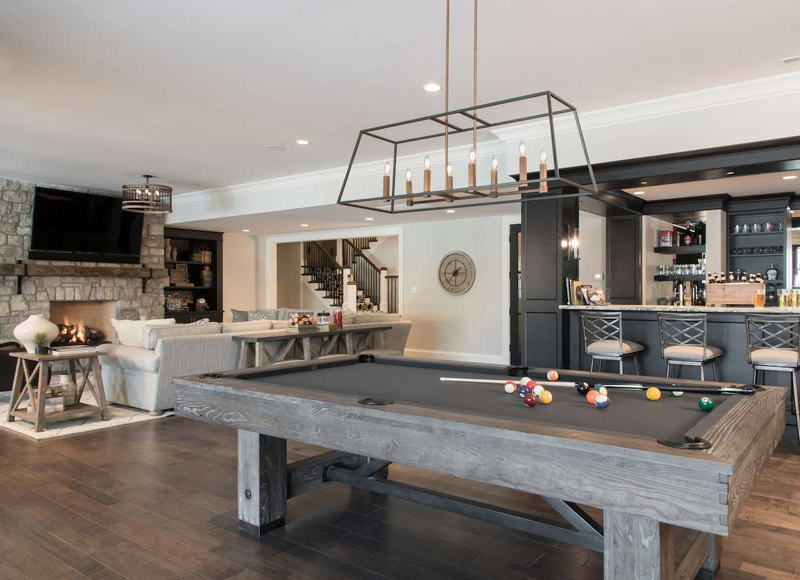 Contemporary light fixtures, a stone fireplace, and a weathered-look pool table create a polished yet comfortable look for this family-friendly space. For lovers of traditional arcade games, The Suite Shoppe paired a Skee-Ball machine with a sleek picnic table and leather benches. Exposed brick, wood floors, and crisp wainscoting complete this urban-chic basement. 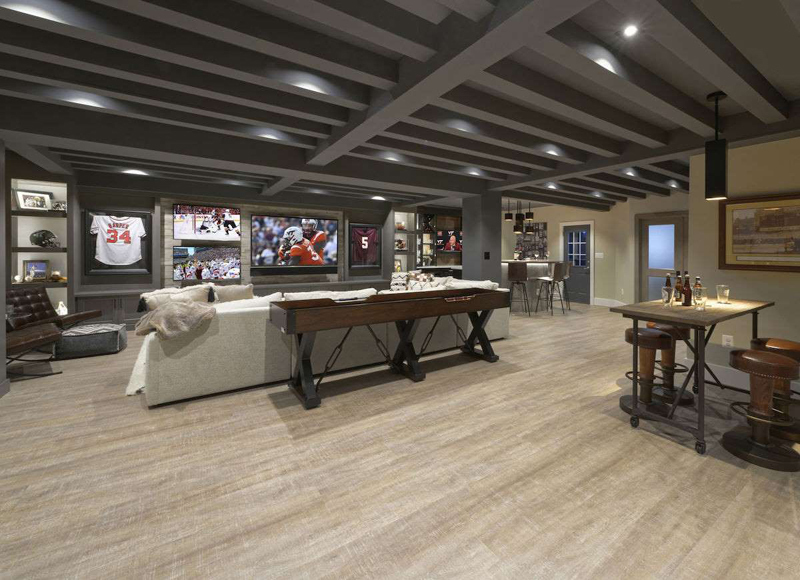 This tasteful sports den has everything a fan could want, including multiple TV screens and display cases for collectibles. Metro Building and Remodeling opened up the space by replacing an existing steel column with a steel support beam. The slate gray ceiling gives the space an industrial edge. Relive the past with modern class in WDG Architecture’s quirky take on a drive-in theater. 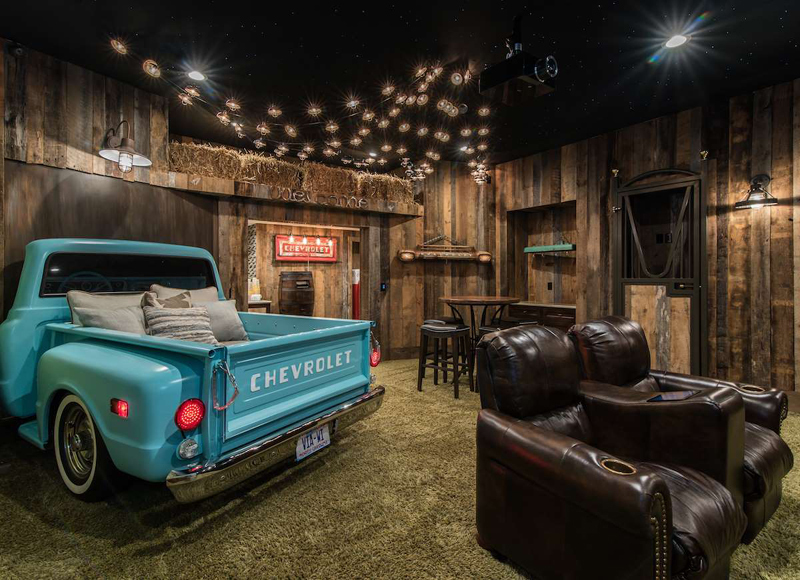 A turquoise Chevrolet provides 1950s charm while chocolate leather armchairs offer comfort in this plush at-home theater. Channel your inner Tony Hawk in Just Basement’s indoor skate park. 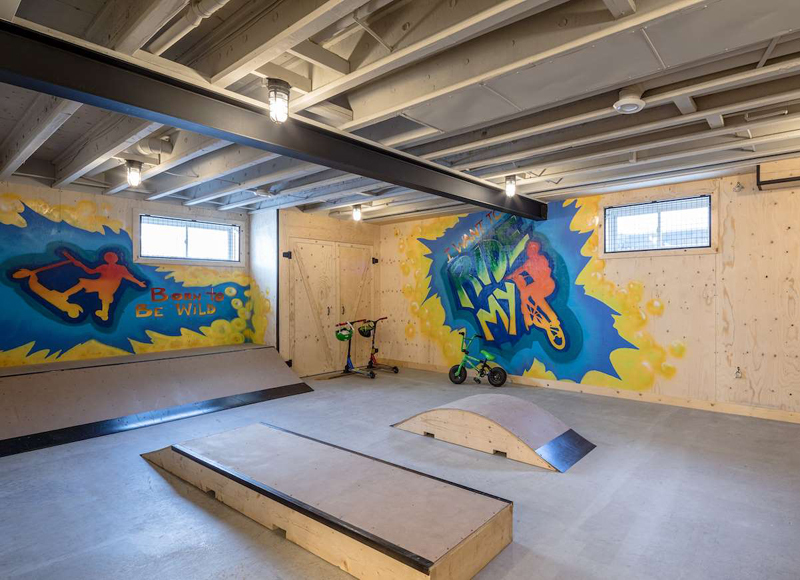 A blend of swagger and sophistication, this basement has a state-of-the-art ramp for practicing flips and tricks. Below the cool concrete beams, graffiti murals give the walls a pop of color. 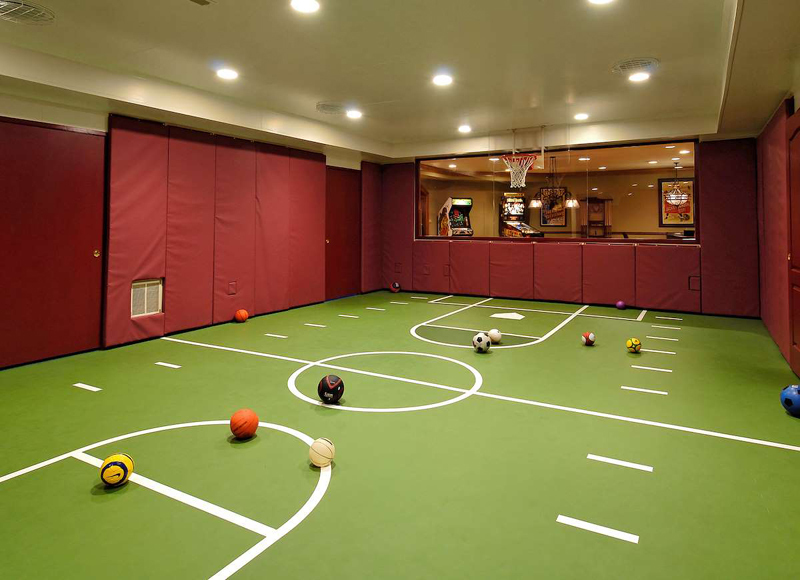 Keep in shape the fun way—with an indoor sports pitch. 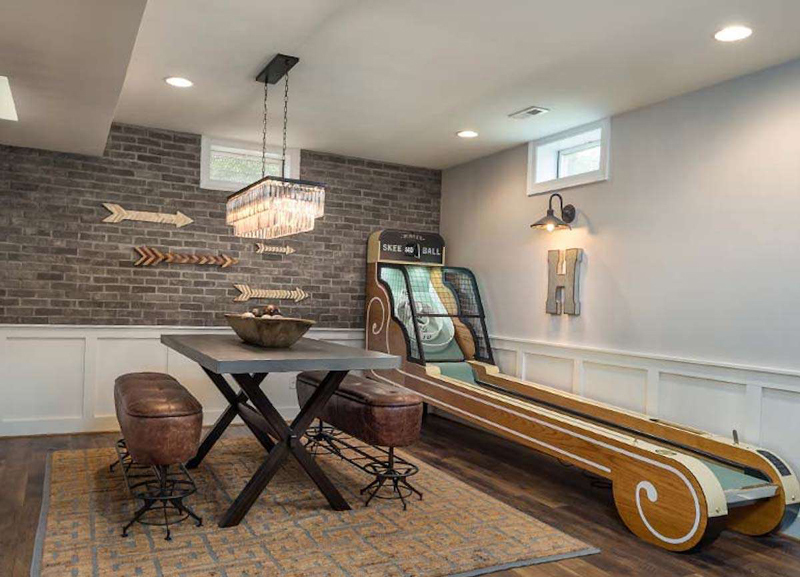 This BOWA-designed room, complete with cushioned walls, rubberized floors, and a basketball hoop, could help transform determined amateurs into champions. Is it a theater or an arena? 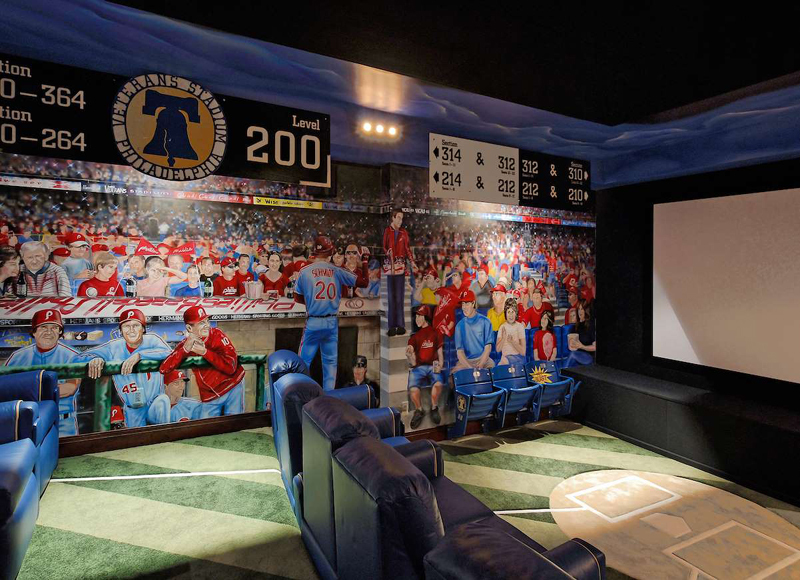 In this sports-themed basement from BOWA, stadium-style signage, carpeting that mimics perfectly mowed grass, and a wraparound mural make viewers feel that they're not just watching the game—they're at the game. 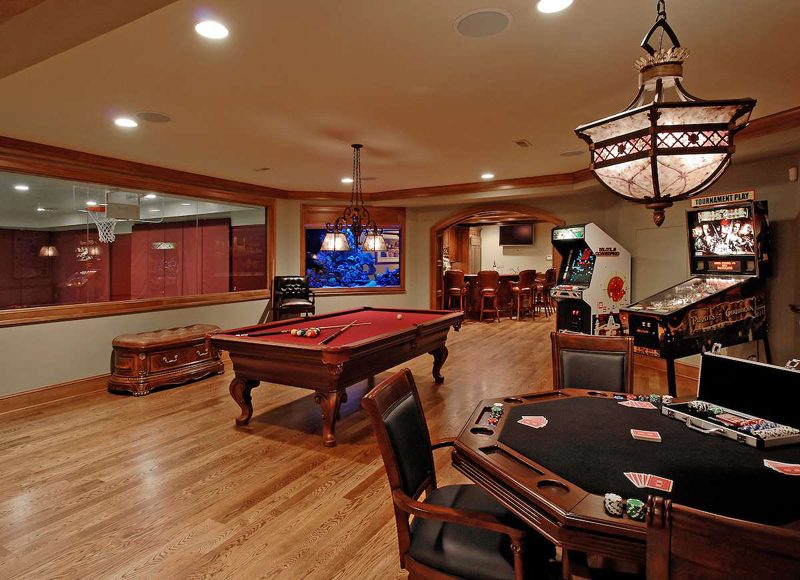 For a more opulent approach to game night, go for carved wood furniture and a pool table with rich red felt. Luxe chandeliers add warmth, while a built-in aquarium brings a touch of vibrant, refreshing blue in this "players" retreat designed by BOWA. 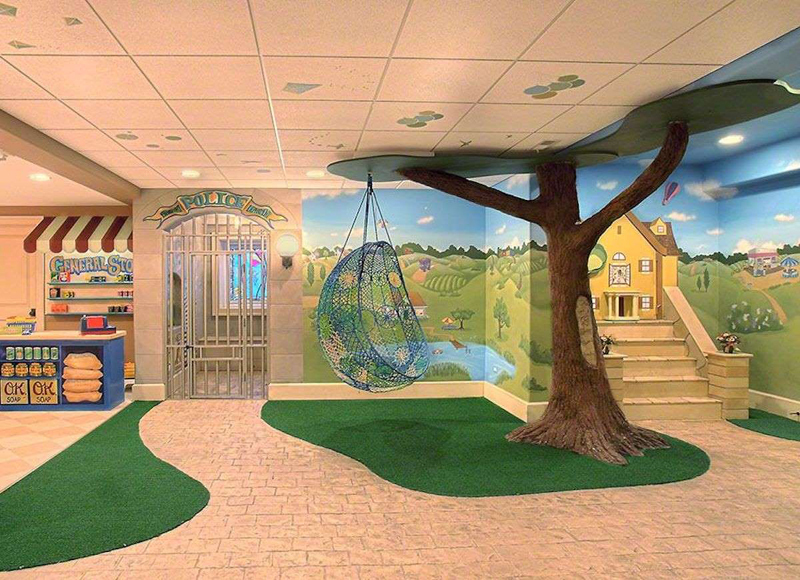 Rainy days won’t stop the fun in this basement playroom by Gander Builders. Kids can run wild in their own private kingdom with a make-believe police station, general store, house, and stage, then when they're done they can rest in the "shade" of a pretend tree. 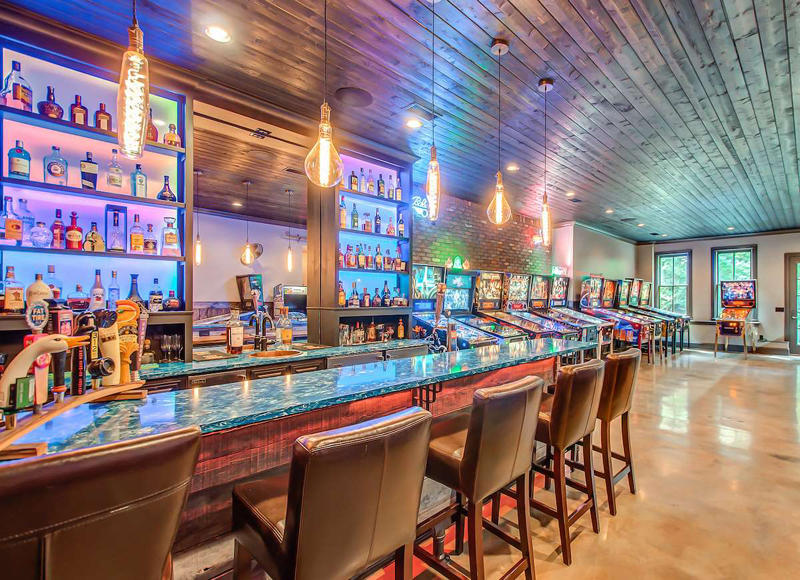 Electric blue lights play over slick countertops, composite floors, and exposed wood ceilings in Superior Custom Homes’ basement bar. The cool palette is brightened by glittering arcade games and Edison-style pendants. Never feel claustrophobic in your basement again! 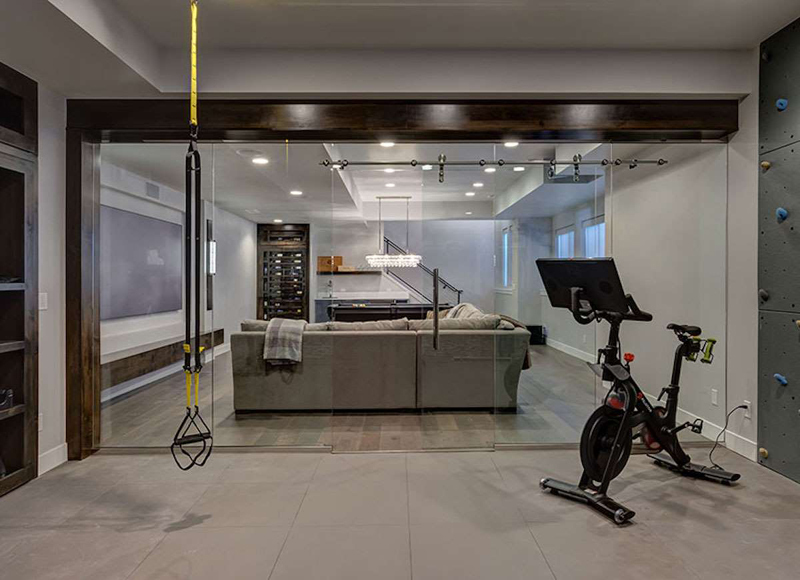 A glassed-in gym by Finished Basement Company provides an airy yet private workout space for weekend warriors. When you’re done with reps, enjoy a cool drink in the dove-gray viewing room. For the perfect farmhouse look, go with cream, white, gray, and warm wood tones to bring light to even the darkest basement. Noelle Interiors amped up the rustic charm with a stone-walled wine cellar, complete with custom shelving and display cases. Knight Remodeling created a comfy relaxation zone with an expansive sofa and a cozy bar swathed in neutral tones. A weathered wood accent wall serves as backdrop for the flat-screen TV.